If you’ve been considering SmartLipo Triplex™ for facial and neck contouring, our board-certified facial plastic surgeon, Dr. Eugenie Brunner, may be able to help you achieve your aesthetic goals by developing a customized treatment plan that is tailor-made to your unique needs. Quick, minimally-invasive, and one of the safest methods for reducing fat along the jawline and underneath the chin, SmartLipo Triplex™ can be an excellent alternative to traditional liposuction and other surgical procedures that require a more extensive recovery. SmartLipo Triplex™ is developed with state-of-the-art laser lipolysis technology, which utilizes three different laser wavelengths – 1064 nm, 1320 nm, and 1440 nm – to target excess fat and stimulate collagen production and retraction (tightening) in the skin. 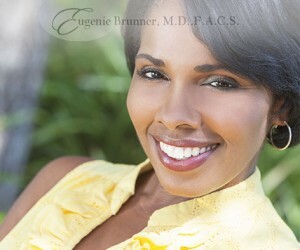 Using one or a blend of these wavelengths, Dr. Brunner is able to optimize results by customizing her approach to address your unique concerns. Due to the intelligent delivery system, SmartLipo Triplex™ is designed to be reliable, controllable, and safe while producing long-lasting results you’ll love. During the initial consultation, Dr. Brunner will develop a comprehensive treatment plan based on your goals and anatomic indicators. Performed in-office, the procedure lasts approximately one hour and results in a recovery period typically extending about two to four days. After about four days, most patients are able to return to work, though you should avoid exercising for at least a full week after treatment. As a minimally-invasive laser treatment, SmartLipo Triplex™ typically causes only mild discomfort, and many patients find it an easy experience. If needed, Tylenol can often alleviate any residual pain. Mild bruising and swelling are normal, and they should dissipate after a few days. Results are generally visible beginning four to seven days after the procedure, and improvement can continue for up to six months or longer. Ultimately, the SmartLipo Triplex™ system can provide enhanced definition around the neck and jawline without the downtime, scarring, and extensive recovery required of surgical procedures. To learn more about this innovative procedure, please contact our office today to schedule a consultation with Dr. Brunner.